Somewhere between our deepest fear and our deepest longings we wait, the world prepares and we wait and watch, knowing all the while that, “Christ has died. Christ is risen. Christ will come again.” knowing that because the world will end, our hope lies in the knowledge that Christ, the Anointed One, the Messiah, will come again. Advent, the very word means come; tis the season of coming. Advent is not about waiting; waiting for Christmas, or waiting for the birth of a baby; Advent is about coming, the coming of Christ. In the darkness of the end, we long for Christ to come. Yes, we will have to wait for Christmas to come; but Christmas will come as it always does. The point is not the waiting, the point is in the midst of darkness, in the trials and tribulations of the end, Christ will come; the point is Christ will come. In the midst of the darkness of the end, our deepest longings are stirred up, our longings for hope, for peace, for love and for joy. All around us we can see the signs of the end; death is everywhere. Galaxies collide and stars die, and there is darkness, the end. Dreams die, and there is darkness, the end. Barriers go up, bullets fly, bombs explode, people die; there is darkness, the end. Words are spoken, promises broken, hopes are dashed; there is darkness, the end. The work dries up, the job ends, funds are exhausted, the bills pile up; there is darkness, the end. Illness overwhelms, shadows on x-rays frighten, scans scare, falls break us, dreams are dashed; there is darkness, the end. In the darkness of the end, we long for hope, for peace, for love, for joy. I remember, when I was a kid; I was about thirteen, we’d just moved to the West Coast and I can still remember it as if it was yesterday. I set off on my bicycle in search of the perfect Christmas I was as moody and emotional as any thirteen year-old could be. I was lonely, because we’d moved around so much that my only close friend was my younger brother; and what thirteen year-old girl, wants to admit that her only real friend is her eleven year-old brother. My parents were worried sick about money. We’d moved, Dad’s job was unstable and Mom’s job barely paid anything. About the only good news in my life was that I was twelve and back in those days, at twelve you were considered old enough for babysitting and babysitting meant money. Every weekend, I would babysit. Looking back on it now, I can’t believe that at thirteen, I was actually left in charge of little children. I remember getting a couple of bucks for babysitting on Friday and Saturday night; and I do mean a couple of bucks, two dollars for two nights of babysitting. I remember, calculating that by the time Christmas arrived, I should have $27 dollars saved up. Twenty-seven dollars should be just enough to buy presents for my Mom and Dad, my brother, my aunt and uncle, and my two little cousins. I still remember heading off on my bicycle, into the bustling metropolis of Ladner. Ladner was just a small fishing village back then. There were just three stores worth looking for Christmas presents in: Perry’s Department store proved to be far too expensive for my blood. So, I headed off to the 5 and 10 store. For those of you who don’t know what a five and ten store was, just think dollar store, only back then it was the 5 and dime and you could actually get stuff for five and ten cents. I spent hours in there trying to figure out the perfect gifts for my brother and my two little cousins. I left thinking that I could take care of their gifts with about five dollars. So it was off to the drug store to figure out what to get for my Mom and Dad and Aunt and Uncle. That took another couple of hours as I agonized over the various Old Spice gift sets. I could just about afford a 3-piece set for my Dad that included saving cream, after-shave and a soap-on-a-rope. 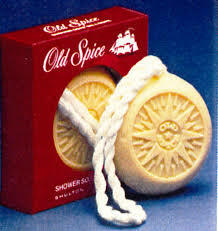 Surely my uncle would be happy with a soap-on-a-rope. Then it was a Yardly gift set for my Mom, dusting powder, perfume and soap all for about six dollars; which would leave enough left over for a small bottle of perfume for my aunt. After all my calculations were made, I figured that I’d have enough left over to buy some wrapping paper and bows. By the end of the first week in December I had figured out what I was going to buy everyone in my family and all for just under $25. So, if all went according to plan I would have a couple of bucks left over, which I would hold onto until New Years’ when I was sure to earn a couple more bucks and then I’d be able to buy a record album for myself. Now if your not old enough to remember when record albums used to cost about 3.99, well you probably won’t know how important it was to be able to tell kids in school that you managed to get the latest CCR, record…CCR…that’s Creedence Clearwater Revival. Anyway, I had it all planned. It was going to be the perfect Christmas. I was happy as a clam. Life couldn’t be better. I set about my babysitting chores with delight, confident that I’d get paid the week before Christmas and there would be plenty of time to head into town to purchase the gifts that I knew would make everyone so happy. I can’t tell you how great I felt. I was ready, I was prepared to celebrate Jesus birthday. It was going to be great! Right up until the moment, the woman whose children I babysat told me that with the holidays coming, she wouldn’t be able to pay me until after the New Year, when her husband got paid. My whole world came crashing down. I only had fourteen dollars saved up, and my aunt owed me another thirteen dollars. Everything was ruined. I couldn’t believe what was happening, Christmas was doomed. It was the end of the world. I tell you this trite little story, not because it is important, but because it illustrates just how easy it is for our world to end. It’s a gentle little story of no consequence that smacks of nostalgia. But I could just have easily made my point by telling you some of the really horrendous stories that are happening everywhere even as we speak, even in some of our own lives, right here and right now. Our dreams of the elusive perfect Christmas; can be dashed in but a moment. Our lives can end in but a moment. Darkness descends and death and decay are but moments away because the end in nigh. And so while the world anxiously prepares for the perfect Christmas, hustling and bustling, we huddle in the darkness as the world comes to an end. We huddle in the darkness longing for hope, for peace, for love, for joy, with only the mystery of our faith to comfort our fears: Christ has died. Christ is risen. Christ will come again. I asked that this photograph of the Antennae Galaxies front and center this morning, because I wanted to talk about the end of the world. The Hubble Telescope took this photograph and it shows us two galaxies colliding and stars being destroyed. It’s a picture not only of the end of a world, but of the end of worlds. Worlds end each and every second of each and every hour, of each and every day, from as far back as the beginning of time; worlds end. Stars die. Dreams die. People die. Hope dies. Peace dies. Love dies. Joy dies. Christ dies. Christ rises. Christ comes again. When galaxies collide, stars die and new stars are born. When dreams die, new dreams are born. People die, new people are born. Hope dies. New hope is born. Peace dies, peace is born. Love dies. Love is born. Joy dies and love is born. Out of the darkness, out of death comes light and life. The Gospel of Luke was written some 60 to 70 years after the man Jesus walked the earth. Two or three generations had passed since Jesus revolutionized the way his followers thought and lived. Since Jesus’ died there had been a revolution against the Roman occupation, which had been brutally crushed. The Temple had been destroyed and most of the religious establishment had fled into exile. Jerusalem lay in ruins. The world was ending. The writer of the Gospel according to Luke puts these words into the mouth of Jesus. “Look at the fig tree”. Each and every one of the Gospel writer’s audience would have understood immediately. The fig tree was a symbol they would have all recognized. From the days of old, in the sacred scriptures and in the hearts and minds of the Jewish people and the gentile followers of the Way, would have recognized the fig tree as the symbol of the religious establishment. Look at the fig tree, it lies in ruins, the people are hiding away in the darkness; but look, look closely and you will see it budding; something is happening; there’s new life, new growth. Do not despair, when you look around and see that the world is coming to an end, if you look closely, you will see new life beginning to bud and grow. People will come together, one by one, together. New life will emerge. Christ has died. Christ is risen. Christ will come again. Advent is the season of coming; for when the world comes to an end, when your world comes to an end, when the darkness is deep and thick and it seems that all is lost…watch and wait. Keep alert. Christ has died. Christ is risen. Christ will come again; a gentle touch, a kind word, a warm embrace, someone has your back, hands are opened, Christ will come again. When a friend or a stranger opens their ears to your pain, Christ comes and listens to your cries. When a friend or a stranger asks, “What can I do?” Christ comes to heal your wounds. When a friend or a stranger, opens their heart to your worries, Christ comes to embrace you. Christ comes again, and again, and again, over and over again, into the darkness of our endings and listens, embraces, heals, and strengthens us, empowers us to spring forth into new life. Christ comes again, and again, and again, over and over again, in the guise of a person. Christ comes again, and again, and again, over and over again, each time you place your hand on another’s back in solidarity; each time you open your arms to embrace those who grieve; each time you reach into your pocket to extend help to those in need; each time you prepare a cup of water for the thirsty, or a meal for the hungry, each time you lend your ear, each time you open your heart, Christ comes again and again. For we are Christ’s Body, risen from the grave. The fig tree, or any other tree will bloom and bud again, summer will arrive, and darkness will give way to light. In the meantime, into the midst of our darkness, Christ has died, Christ is risen. Christ will come again and again and again. Christ has died for we have died. Christ is risen for we have risen. Christ will come again and again, for we will come again and again. The world is ending. New worlds, new stars, new buds, new life is germinating in the darkness and will rise up, in you and in me for we declare with our lives and with our actions, with our hearts open, and our arms extend, we declare the mystery of our faith: Christ has died. Christ is risen. Christ will come again and again, and again. Let it be so. This entry was posted in Adult Education, Bible Study, Evolutionary Christianity, Progressive Theology, SERMONS, STORIES, Theology and tagged Advent Stories, Christmas Stories, emergent theology, evolutionary christianity, Lutheran sermon Advent 1C, Lutheran sermon Luke 23:33-43, Progressive Christian sermon Advent 1C, progressive Christian sermon Luke 23:33-43, progressive christian spirituality, progressive theology by Rev. Dawn Hutchings. Bookmark the permalink. Thanks for this! I love the Antennae galaxies image. I’m going to incorporate it into my sermon somehow. Thanks for the inspiration!